Spacious 3 Bedroom, 2 Bathroom apartment with 1 allocated parking space located in the newly completed Queenshurst Development. 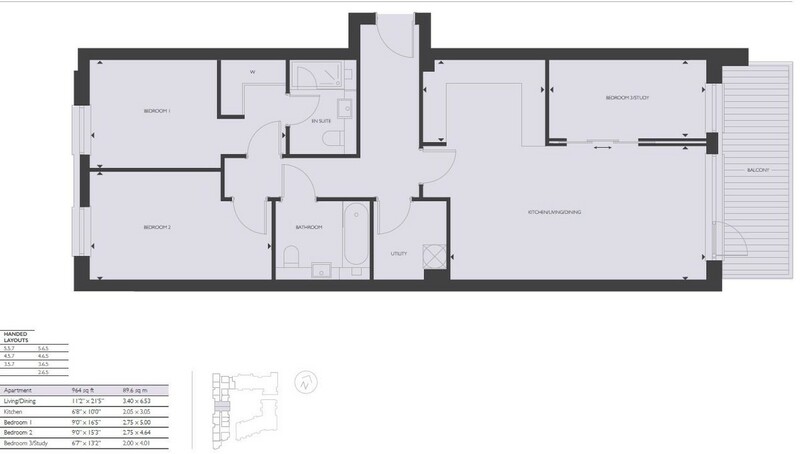 Featuring 2 king sized bedrooms, 1 small double/ study room, open plan kitchen, walk in wardrobe and tiled bathrooms. This apartment overlooks the courtyard gardens and benefits from a large private balcony. Available Now. Queenshurst by Berkeley Homes is situated in the lively market town of Kingston-upon-Thames. Queenshurst features a collection of stylish 1, 2 and 3 bedroom apartments located just a five minute walk from the towns train station and town centre. Kingston is home to a fantastic selection of shops, bars and restaurants, it also has the advantage of quick and easy access to Central London. Spacious 3 Bedroom, 2 Bathroom apartment with 1 allocated parking space located in the newly completed Queenshurst Development. Featuring 2 king sized bedrooms, 1 small double/ study room, open plan kitchen, walk in wardrobe and tiled bathrooms. This apartment overlooks the courtyard gardens and benefits from a large private balcony. Queenshurst by Berkeley Homes is situated in the lively market town of Kingston-upon-Thames. Queenshurst features a collection of stylish 1, 2 and 3 bedroom apartments located just a five minute walk from the town’s train station and town centre. Kingston is home to a fantastic selection of shops, bars and restaurants, it also has the advantage of quick and easy access to Central London. 24-hour concierge gives residents peace of mind. The beautifully styled hotel-like entrance with high ceilings and a large open space offers residents the very best of London living. The 9 seated cinema is the perfect space for entertaining guests throughout the year. The two storey state of the art gym allows you to exercise from home using a wide selection of equipment to suit your every need. The linear garden square allows residents a tranquil place to relax with the lively town centre of Kingston only a 5 minute walk away. Minimum 12 month term for a furnished let.